A decade of elegance in boat building and design is behind the Elandra name. Owning an Elandra yacht makes it a staunch and stable experience for the owners which have a say in the yacht design since the company supports the semi-custom yacht building paradigm. The engineering department has done an amazing job in creating a variable convex hull shape which offers a smooth ride in all their sports yachts; they can additionally boast their good fuel economy. Speaking of the design, Elandra placed the exhausts underneath the water and therefore is very quiet when the vessels comfortably cruise at a speed of 30 knots. 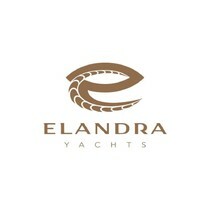 All in all, Elandra is a high profile company which aims to improve the experience of all yacht owners. The Elandra 53 is for sale so let’s dive into the review to see if it possesses all the necessary qualities that you are looking for. 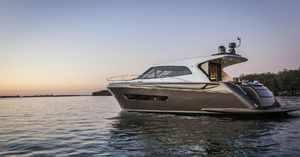 The Elandra 53 is a sedan type sports boat with a length of 55 feet, packed with luxury details and more room than one could initially expect after seeing the boat for the first time. 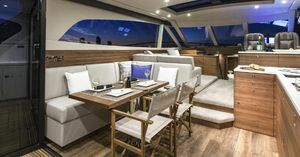 American walnut is used primarily for the design of the boat; however, a nice contrast is made by the Ultra-leather panels. 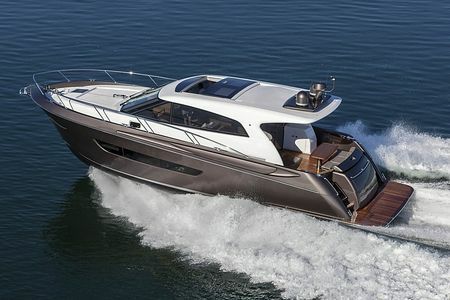 Spaciousness is nicely evoked through the open design of both the saloon and helm. Stainless steel covers almost the entire length of the boat. At the bow, there is a sunbathing area with a sunbathing mattress dipped in grey tones which go very nicely with the white and brown tones. There is a small hatch which houses the rod. Side passages lead to the cockpit area; this area in a sense represents an entertainment place with a nice couch for 5 people and two chairs. The table is basically a dining area. Next to it is a wet bar area with a foldable upper area of the cabinet and a small sink and faucet. Going down the stairs, one reaches the stern area which is quite spacious for this type of yacht and it even has a garage space for pods. Going up the stairs and past the sliding glass door, one reaches the yacht’s galley. On the left-hand side there is a comfy L-shaped couch and a small table which at first doesn’t seem like much, but once folded out it can serve as a dining table when the weather isn’t favourable to dine outside. Opposite is a very functional kitchen space with a built-in oven with push cabinets above it which are quite practical. Enough storage space and a built-in cooker along with a faucet and a basin complete the offer of the kitchen. Beyond the galley is the saloon which houses a comfy L-shaped couch on the left side. There is a divider which has a storage space and a TV hidden inside of it. The LCD TV slides upward from the divider. On the opposite side is the helm station which has two comfy seats with the wheel being in the right position for the captain. Technology has been utilised effectively. The 16 inch Simrad NSO multifunction touchscreens are nicely wrapped in leather; in essence, this represents the heart of the electrical system of the Elandra 53 in combination with 3.5kW Mastervolt inverters. The advantage of such a system is that it monitors the entire yacht and besides the ability to choose operating modes, the system has the ability to automatically turn on generators when the batteries run low. If we continue forward from the saloon and down the stairs, we reach the lower deck through the corridor. The VIP cabin is straight ahead, with a large comfy bed in the middle of the room. On both the left and right side of the bed there are cabinets for storage which offer more than enough room. The guest head can be reached through a door in the VIP room; there is a low cabinet and a lavatory in it. The toilet bowl is on the right side and the bathroom represents a nicely designed compact area which has everything one needs in a small space. On the left side is a glass door which leads to the shower; however the doors are not see-through. On the right-hand side of the corridor is the guest cabin with two bunk beds and a storage space on the right side which stores the washing machine and dryer. Additionally, the master cabin can also be reached from the lower corridor. This room is more spacious, a large bed is in the middle with a storage space (once the mattress is raised). In front of the bed is a commode which has a lot of drawers for storage space and an LCD TV. The Master Head is on the right-hand side of the room which is quite similar to the guest head; however there are glass doors on both sides of the head, the right one leads to the toilet bowl area and the left one to the shower which is more spacious than the guest shower. The engine room can be reached from the cockpit area through a hatch near the dining table. The Elandra 53's price is determined mostly by what is in the engine room. Namely, a standard pair of Scania DI13 750 hp engines come in the Elandra, however, another option offered by MAN is given to future owners. A pair of MAN R6-800 six-cylinder turbo diesel engines is offered, a whopping 800 hp and 2,700Nm of torque. With such engines, the gearbox needs to be a special one, and boy it sure is! A pair of ZF 3351A gearboxes with custom ratios offers exceptional performance for the entire yacht which can reach speeds of over 30 knots. In essence, the Elandra 53 review touched upon the most important aspects of the yacht. 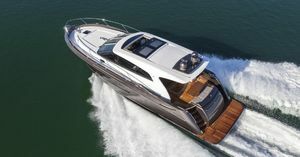 If you’re looking for a comfy, luxurious sports yacht, you have found your ideal yacht. Don’t waste any precious time. You have read enough to decide rightly. Call us now for your very own sports stallion! 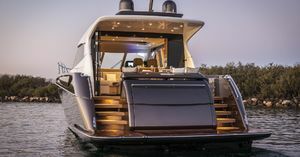 In the bow is the VIP cabin, with an offset island bed. There are portlights on both sides and the mattress lifts on gas rams for easy storage beneath. Once moored or anchored, expansive deck space gives you an extraordinary amount of room to move or relax. Even the garage has more space, opening to reveal a large tender with a roomy lazarette on both sides. Store more toys, rods and tackle, dive compressor and bottles, additional freezers - as anyone whoâ€™s into cruising knows, you can never have too much storage. The VIP shares access to the forward head with a double bunk cabin and on this debut model, there is a washer and dryer fitted in the wardrobe of this starboard side accommodation.